If you're a Cardiff fresher, you might have got out and about to explore the different areas of Cardiff, or you may not have got to know much beyond your immediate environs of halls and uni. So over the next couple of weeks, let us guide you to the different areas of Cardiff where students most commonly live, to help you find the best place for you. 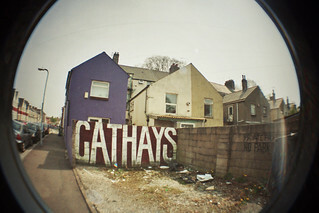 Cathays is at the heart of studentville, so most Cardiff students will know this area very well already! In common parlance, Cathays usually refers to the triangle formed by the two railway lines that split at Queen’s Street Station, and bounded by Cathays Cemetery and Maindy Barracks at the top, although technically the ward includes the City Centre and Cathays Park campus of the university. Main roads in Cathays include Cathays Terrace (where we have our office! ), Woodville Road, Crwys Road and Senghennydd Road. If you’re in halls at Senghennydd Court, Colum Road or similar, you know the deal. If you want to be just a heartbeat from the university, Students’ Union and city centre, this is a great place to live. There’s plenty of choice of Cathays student accommodation, and there’s nothing quite so handy as being able to roll out of bed 5 minutes before your lecture and still make it on time! Depending where exactly you are in Cathays, either Bute Park or Roath Park will be within a reasonable distance if you want to enjoy somewhere green and leafy for a picnic or kicking around a football. If you’re in the further reaches of Cathays, you might want to catch a bus or taxi into the city centre but it’s walkable for most students. On the downside, parts of Cathays are rather shabby and run-down. And if you’re sticking around in the summer break to work in Cardiff, Cathays turns into something of a ghost-town. Indeed, the rubbish-strewn streets after everyone moves out at the end of July would be a good opportunity for guerrilla filming of a post-apocalyptic movie. You can also end up paying more for being close to the university – properties further away can be higher quality for the same price, so weigh up what’s more important to you. Cathays is unsurprisingly well-served for pubs! The Woody is a student favourite, but if you prefer a pub frequented by locals, then The Gower, tucked away behind Co-op, is a good choice. Ramon’s is a legendary greasy spoon on Salisbury Road – perfect for a fry-up after a big night out. Park Place finally got a café when Costas opened recently, though it’s a lot pricier than the Kitchen in the Union. Thé Pot is a nice independent café on Crwys Road. Venture beyond Cathays to the far side of the railway line, and you find yourself in Roath. Parts of it are very similar in feel to Cathays, but venture towards Roath Park and it becomes greener and leafier. Venture further still and you get to Pen-y-lan, which is much more suburban and the kind of place where “normal” people (those with families and mortgages and stuff!) live. If you’re willing to walk a little further in to uni, then Roath and Pen-y-lan are great areas to live in. A bit less studentified than Cathays, these areas more varied, mixing students with graduates and young professionals and ethnically and culturally diverse local people. The local scene is vibrant and varied, from the Gate Arts Centre to annual Made in Roath festival – check out our guide to arts and culture in the Roath area There’s a weekly market at the Mackintosh Centre on Saturday mornings, and plenty of coffee shops ideal for meeting friends or doing university work. Roath Park has playing fields, gardens, sports facilities and the lake, where in summer you can muck around in boats! Albany Road offers as many charity shops as a cash-strapped student could wish for, while Wellfield Road offers a more upmarket range of shops and stores just around the corner. City Road has a bewildering array of take-aways. Bear in mind these are all in easy reach of Cathays, of course. Although very diverse, with the streets running from Albany Road up to Roath Park run the whole gamut of the economic spectrum, for example, from pokey terraced houses at one end to large posh family homes at the other, there are parts of Roath that are quite rundown. City Road probably has too many takeaways even for the most dedicated student connoisseur of late-night junk. Varsity and the George are popular student haunts, but the real pub of choice in Roath has to be The Albany, located just far enough away from Albany Road for the name to be misleading. Two-time winner of the CAMRA Pub of the Year, and with a barman with a Moustache of Special Magnificence, this place has real character and a great beer garden. Local café chain Coffee #1 has branches on both Albany Road and Wellfield Road, just minutes’ walk from each other, retaining an indy feel that’s a good alternative to the nearby Caffe Nero. Waterloo Gardens Teahouse is another highlight, with an amazing selection of teas and great cakes. How do I choose the right housemates?